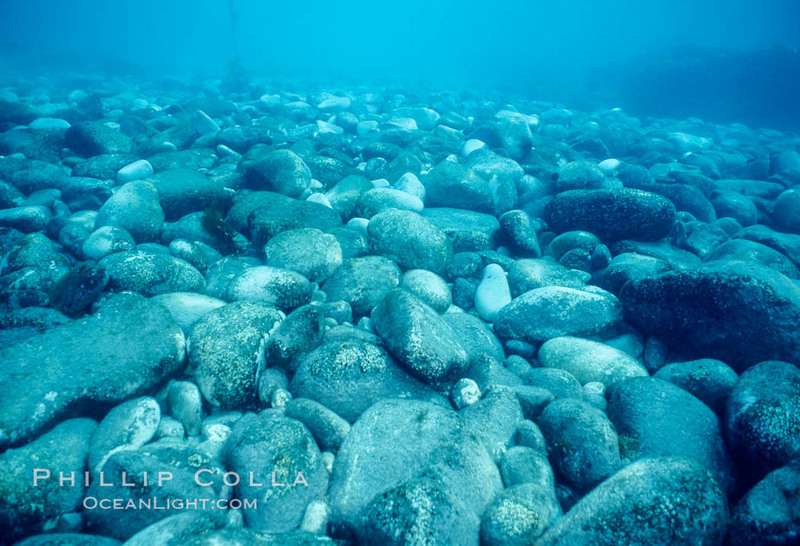 I’ve spent hundreds of hours in the shallows at Guadalupe Island (Isla Guadalupe). The diving is so special there that I will spend every minute I can in the water, breathing a little as possible and waiting until my tank is drained before surfacing to call for a skiff ride back to the big boat. The long eastern shore of Guadalupe Island is typically protected and calm, and this is where much of our diving is done. Drifting around with the mild surge, I’ll find Guadalupe fur seals, usually solitary males but sometimes juveniles in small groups, sea turtles, the very occasional elephant seal, lots of lobster and, since Guadalupe Island straddles both temperate and tropical ranges for many types of fish, a great mix of species. Sometimes too I’ll just zone out in the protected pocket cove, turning over the cobblestones that line the bottom looking for cowries and other weird stuff. Boulders cover the ocean floor, worn round and smooth by centuries of wave action.